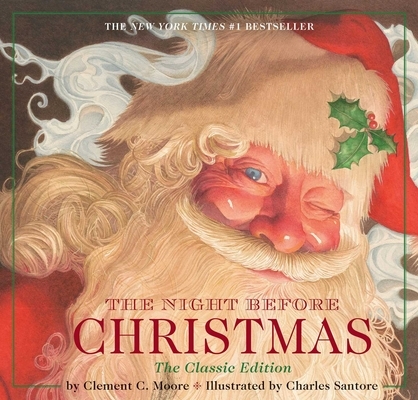 "Santore has illustrated many classic stories, including Snow White, The Wizard of Oz, and The Little Mermaid, and he now brings to life Moore’s 'A Visit from St. Nicholas' in characteristically elegant and detail-rich paintings. His is a very traditional vision, as he brings readers inside a stately colonial home, tastefully appointed with wreaths, garlands, and stockings. In a particularly nice bit of design, when the narrator 'Tore open the shutters and threw up the sash,' readers can do the same, opening a double-page gatefold that reveals a quiet village blanketed by snow—and a sleigh silhouetted against the moon. It’s a gorgeous interpretation of a beloved holiday classic. All ages. (Oct.)"